Fisherman cleaning and filleting a fish. Photo courtesy of NOAA. What is subsistence? Subsistence fishing and shell-fishing is the practice of harvesting species for food rather than catching for sale and income generation. Subsistence is not a measure of economic stratification, as both poor households and affluent ones engage in subsistence. However, for those who do rely on marine harvests for food security in the absence of other economic resources, the importance of subsistence for meeting basic needs is much greater. Here, we examined data from the Pacific Fisheries Information Network (PacFIN) to show that subsistence co-occurs in market systems, representing multiple diverse and informal economies. We analyzed twenty years of commercial landings from hundreds of ports in Washington and California. Our focus is on the extent, range, and species diversity of fisheries removals, specifically, “personal use” removals compared to the dominant type of removal: commercial. PacFIN data between 1990-2010 show that over 37.5 million pounds of fish and shellfish were kept for personal use. Personal use harvest volumes constitute a fraction of the total fisheries catch in WA and CA (.3% of 11.4 billion pounds landed during that same period). While minor in the larger commercial context, personal use/subsistence harvests represent a significant amount of high protein food for communities. Over 30.4 million lbs. personal use (81.3%) was landed in Puget Sound. Nearly 85% of the personal use is from WA tribal participants, and yet total tribal commercial harvest comprises only 4.6%. The majority of personal use harvests is practiced by WA tribal fisheries. Nonetheless, a significant number (15%) of the personal use removals is from nontribal participants, indicating that nontribal sectors also engage in subsistence. Prevailing economic utility theory suggests that fishermen operating within the industrialized market-oriented fisheries will seek to maximize profits from their commercial harvests. Following this line of thinking, commercial fishing operators would only retain low market value fish for personal use as it coincides with reduced opportunity costs, or when doing so minimizes the lost profits of keeping high-value fish. Top 10 Species Kept for Personal Use by Population Group in Washington, values are landings in lbs. In this paper, we tested this relationship between subsistence drivers and market behavior with the following hypothesis: as the price per kilogram of a candidate species goes up, personal use (proportion of kilograms kept for personal use) would go down. Following this hypothesis, we expected a negative relationship between price and the proportion retained for personal use. 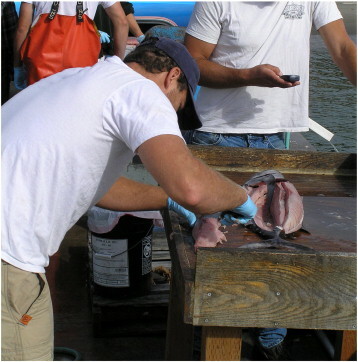 We used general additive models to examine patterns in proportion of personal use versus price for the top 10 species retained over the 20-year period for each of the three population groups: Washington commercial tribal (indigenous) fishing operators, Washington commercial nontribal operators, and California commercial fishing operators. We conclude that profit maximization is not a reliable predictor for subsistence behavior. Although a nominal figure in the overall seafood catch, the presence of subsistence practices among 21st century market-based commercial fishing operators reveals a more diverse array of economic systems than previously imagined. Subsistence is seldom the exclusive approach to procuring household food needs, nor an exclusive livelihood mode. Often distributed within communities through sharing, gifting, and bartering, personal use harvests of seafood is linked to diverse cultural food and economic traditions. We suggest that alternative economies, including subsistence and associated community share systems, function to improve human wellbeing and strengthen community resilience by increasing food security and food knowledge systems, engaging in a quality of life practice, and supporting social networks. Poe, M. R., Levin, P. S., Tolimieri, N., & Norman, K. (2015). Subsistence fishing in a 21st century capitalist society: From commodity to gift. Ecological Economics, 116, 241-250.